TOKUMEI SENTAI GO-BUSTERS premiers on 2/26/12 at 7:30! Predicting that their enemy might return and attack in the future, humans decide to build giant robots and machines, training chosen warriors to use this technology and fight against the Super Computer. That fated day has arrived. And so, TEAM GO-BUSTERS is formed, Tokumei Sentai Go-Busters! Now their battle begins! Go-BusterAce is the most powerful form of Red's mecha. 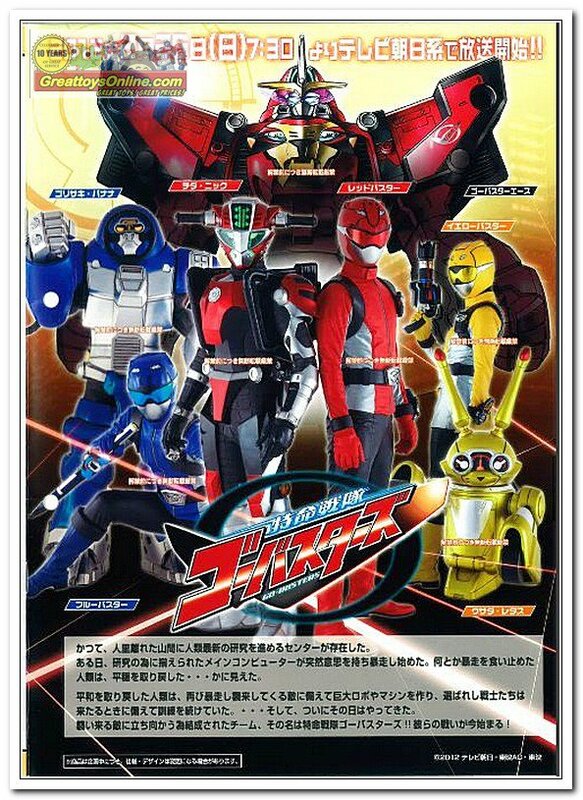 The set includes Red's Buster Machine (a Sports Car) and Red's Buddy Roid, Chida Niku. Chida Niku, as a Buddy Roid, can transform into a cockpit for RedBuster to pilot. Chida Niku and Red's Buster Machine can combine into the "Buster Vehicle CB-01 Cheetah". Cheetah can then undergo a transformation into animal form, making it into a Buster Animal, "Buster Animal CB-01 Cheetah." That form then transforms into the robot, Go-BusterAce. 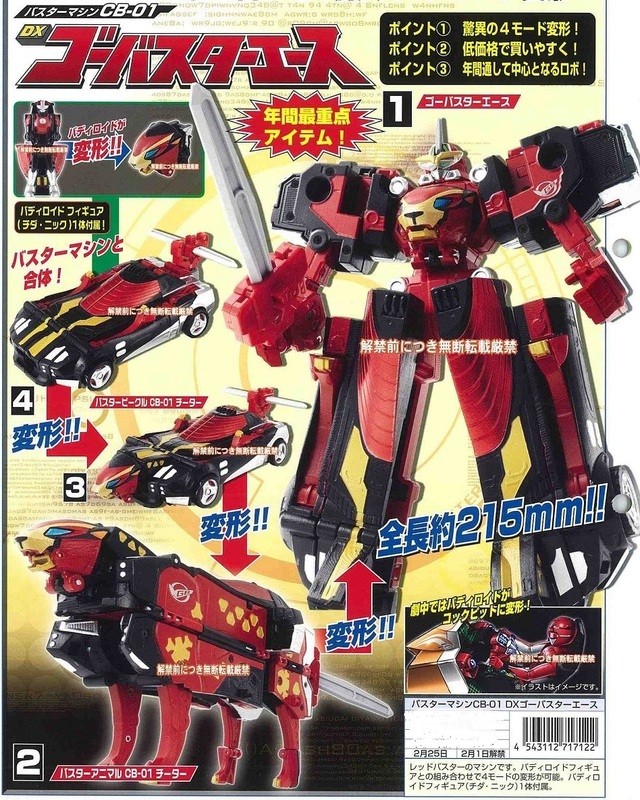 Combines with Gorilla and Rabbit to form Go-BusterOh. Blue's mecha. 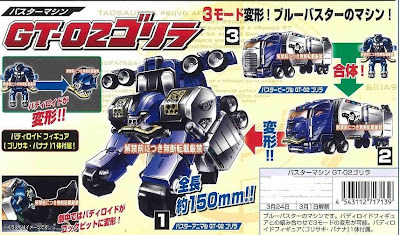 Set includes Blue's Buster Machine (a truck) and Gorisaki Banana, Blue's Buddy Roid. 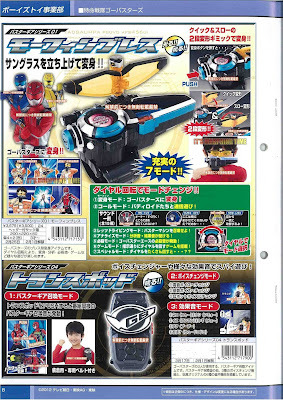 Gorisaki Banana, as a Buddy Roid, can transform into a cockpit for BlueBuster to pilot. 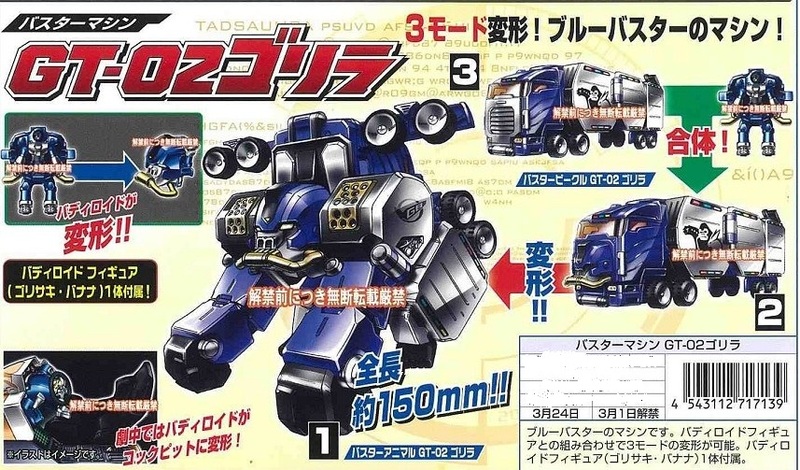 Gorisaki and Blue's Buster Machine can combine into the "Buster Vehicle GT-02 Gorilla", which can then undergo a transformation into a Buster Animal, "Buster Animal GT-02 Gorilla." Combines with Go-BusterAce and Rabbit to form Go-BusterOh. Yellow's mecha. 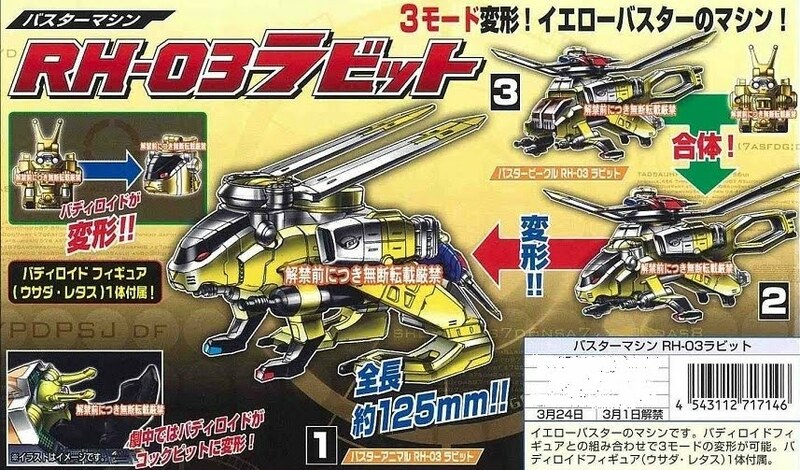 Set includes Yellow's Buster Machine (a helicopter) and Usada Letas, Yellow's Buddy Roid. Usada Letas, as a Buddy Roid, can transform into a cockpit for YellowBuster to pilot. 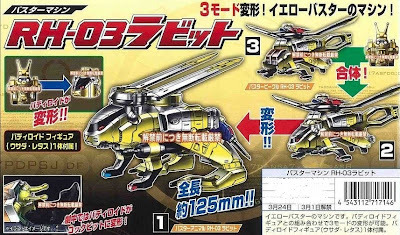 Usada and Yellow's Buster Machine can combine into the "Buster Vehicle RH-03 Rabbit", which can then undergo a transformation into a Buster Animal, "Buster Animal RH-03 Rabbit." Combines with Go-BusterAce and Gorilla to form Go-BusterOh. DX Go-BusterOh, the combined form of Go-BusterAce, Gorilla and Rabbit. The Gobusters' transformation device. 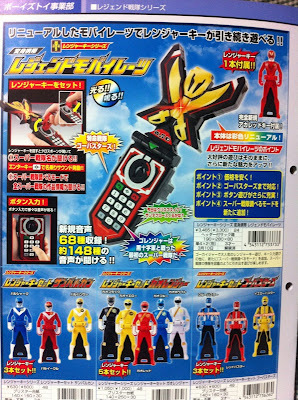 Has a Henshin Mode (transforms the rangers), Call Mode (summons Buddy Roids), Let's Driving Mode (summons Buster Machines), Analyze Mode, Robo Mode (activates GobusterAce), Game Mode (play a game using the dial on the MorphinBrace), Special Mode (secret mode activated via the brace's dial). 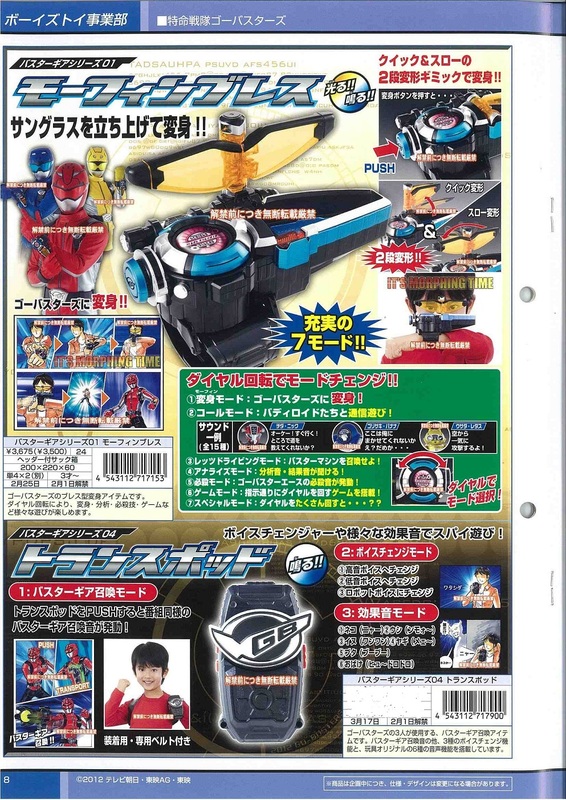 Looking at the pictures, the henshin call seems to be "It's Morphing Time", with the catchphrase for the show being "It's time for Buster". Camera that changes into a gun. Based on an "ichigan" (single lens reflex camera). In Camera Mode, the toy can simulate zoom and shutter movement. 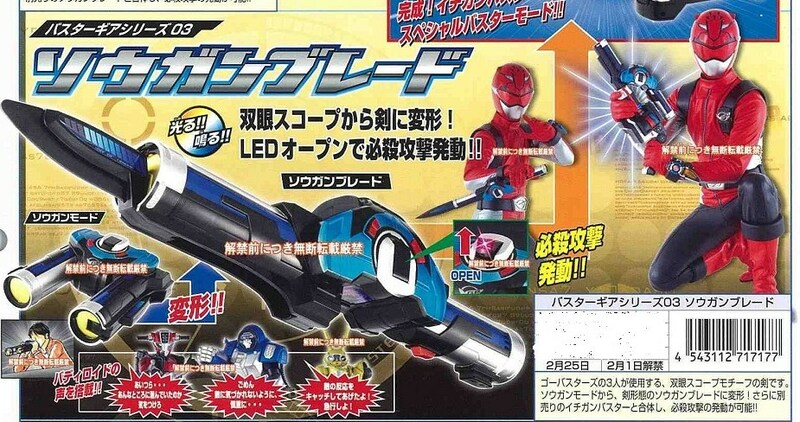 Can combine with the SouganBlade to form the "Ichigan Buster Special Buster Mode" Lights and sound. Binoculars that change into a sword. Name taken from "Sougan" (Binoculars). In Sougan Mode, seems to have a working scope. Looks to contain sounds of the Buddy Roids. 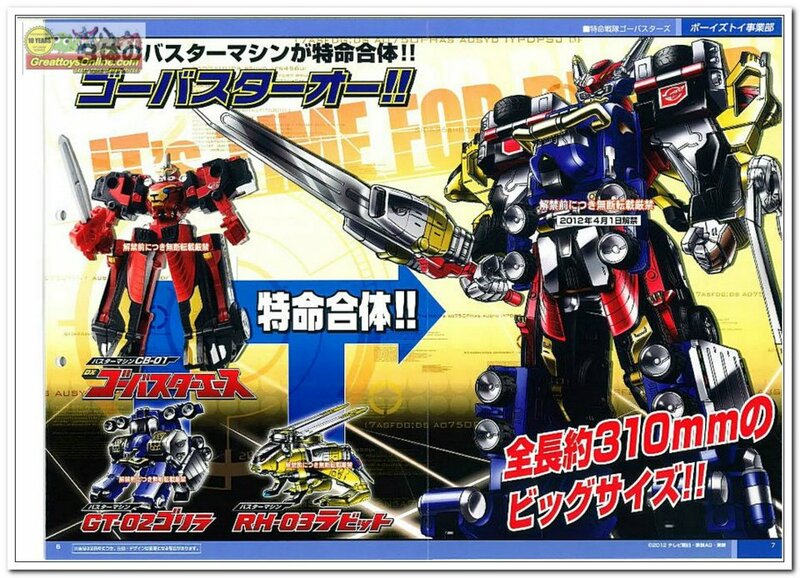 Can combine with the IchiganBuster to form the "Ichigan Buster Special Buster Mode. Lights and sound. A new Mobirates with more sounds and functions. Part of a secondary line for Ranger Keys.